A grain mixture for cattle, horses, sheep, and goats. 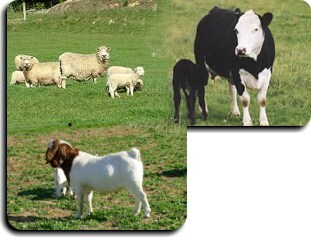 Feed to cattle, horses, sheep, goats, and other livestock along with good quality hay or pasture. Cattle, horses, sheep, goats: feed as needed to maintain proper condition depending on forage quality. When making a ration change, allow 3-5 days for sheep and 7-10 days for other animals to adjust to the new ration. Provide a source of fresh clean water at all times. Keep a constant supply of hay or pasture to animals. Provide adequate feeder space for each animal. Feeders should be well protected and well managed to prevent feed from becoming wet and molding. When fed from a self-feeder, adjust feeder to minimize quantity of feed accumulating in trough. Consult your veterinarian for recommended health program for your local area. Provide source of mineral free choice. Store feed in a dry area, away from insects. Do not feed moldy or insect-infested feed to animals, as it may cause illness, abortion, or death.